What’s it like at Zebra Kita? 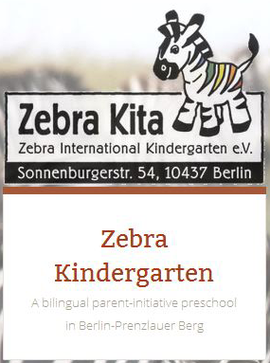 Zebra Kita is a bilingual parent-initiative kindergarten in Berlin Prenzlauer Berg, open Mon-Fri 8am to 5pm. Our core team of 3 permanent teachers looks after 19 children aged 2-6 years. They are supported by part-time substitute teachers and one volunteer (BundesfreiwilligerdiestlerIn). Since we’re a small kindergarten, teachers play an integral role in the structure, atmosphere and curriculum of our kindergarten. Teachers also have close contact with parents, who volunteer to cook, do repairs and keep the kindergarten running. Even when we have no openings, we are always happy to hear from qualified English speaking teachers. Feel free to send us your application. Kindly note that we can only consider applications form candidates who are eligible to work in Germany.